Flying directly in to Anchorage puts you in the middle of the Alaska adventure right away. Anchorage’s airport is just a few minutes from downtown, so you won’t waste any time in transit before starting your exploration. Many of Alaska’s most amazing sights are within easy reach. From glaciers and wildlife to history and heritage, this city has it all! Don’t doze during the approach to Anchorage; you’ll miss the first views of the mountains that surround the city! Your adventure starts before baggage claim. Check out the airport’s Alaska Native art collection; the mezzanine-level gallery has a fantastic display of works from across the state. There&apos;s even a spot not far from the airport to find your first moose fast. Take a hike! Chugach State Park has hundreds of miles of trails and is mere minutes from where you are staying. The Glen Alps trailhead offers convenient access to some of the park’s most popular hikes, including Flattop. Even from the beginning of the hike, you’ll have a stunning view of the city below, the waters of Cook Inlet and, on a clear day, Denali. Enjoy the flavors of Alaska. Sample salmon, halibut, crab and more at Anchorage restaurants. You can be sure it’s fresh, local and tasty! Find a restaurant with inlet views or one perched over the salmon fishery of Ship Creek. Pedal Power! Bike rentals are an inexpensive and exhilarating way to explore the city. Cruise along the Tony Knowles Coastal Trail, an 11-mile paved trail that runs from downtown to Kincaid Park. You’ll hug the coastline in view of Mount Susitna, better known as Sleeping Lady, then dip into the woods closer to the park. 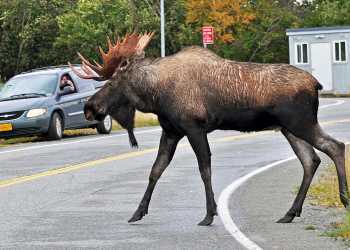 Moose and migratory birds are regular sights as are bald eagles! Check out the galleries at the Anchorage Museum. You’ll find a world-class facility with fascinating exhibits on Alaska&apos;s history, art in the north and the science that shaped the state. Catch a movie that shows all of Alaska’s majesty. In summer, long daylight hours prevent you from seeing the northern lights, but photographer Dave Parkhurst’s film “AurorA – Alaska’s Great Northern Lights” at the Alaska Center for the Performing Arts shows you dazzling shots of the aurora. DAY 3 NEXT STOP: GLACIERS! Hop aboard the Alaska Railroad for the trip to the Spencer whistle-stop. The train departs Anchorage southbound, winding along the coast of Cook Inlet then turning into the valleys of the Chugach National Forest. You’ll hop off at the modest stop at Spencer for the next leg of your adventure. Spencer Glacier isn’t accessible by road, so you have exclusive access to this natural treasure for the day. Walk the lakeshore or book a guided hike, canoe or rafting trip in advance to get an up-close look at this icy wonder. Not all glacier views involve hiking or paddling. Take the train back to Girdwood, then ride the aerial tram at Alyeska Resort. From there you’ll have stunning views of more than half a dozen hanging glaciers in the Chugach Mountains. Spend the night nestled in Girdwood. Make the most of your travels in Alaska.